When Carrie Ann Cole bakes a lemon meringue pie to die for that actually kills someone, she must find out who the real killer is before her time at the Kensington Palace expires. The elegant Orangery at Kensington Palace is the perfect setting for the bridal shower of Carrie Ann Cole’s best friend’s sister. Personal chef to the royal family, Carrie Ann’s pie theme is naturally winning. But a waiter later keels over dead into the lemon meringue pie she leaves as a thank-you to the staff and Carrie Ann realizes that somebody slipped a mickey into that meringue. Her floury fingerprints are all over that pie and the authorities suspect her distress is a cover-up for murder. Carrie Ann must set out to clear her name if she wants to stay at her dream job any longer. But all too soon, another body drops in the Orangery. This time, it’s the Orangery chef. Murder won’t crimp her style, and as bodies pile up, Carrie Ann uncovers palace intrigue, London nightlife, and British pies scouring for the killer in Lord of the Pies, the witty follow-up to Nell Hampton’s Kale to the Queen. 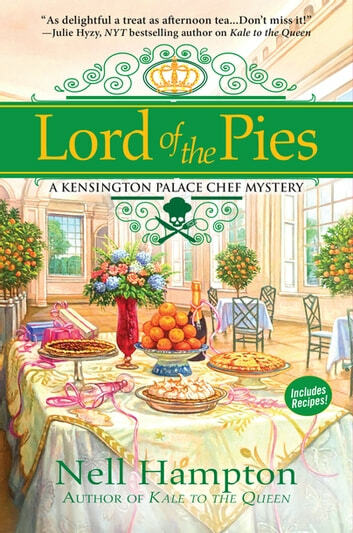 Lord of the Pies by Nell Hampton is book two in the Kensington Palace Chef mystery series. Even though I have not read the first book in the series, I was able to follow along in the story without feeling lost. I realized I missed out on how Chef Carrie Ann Cole came to cooking for the Duke and Duchess of England, the second book flashed back enough bits that I was able to create the vision. In this story Carrie Ann, Chef Cole, is still trying her best to prove that just because she is an american, she is worthy of cooking for the Duke and Duchess. So when the opportunity arises to enter a pie bake-off, she jumps at the opportunity. But when it seems someone is out to murder people with poison, the finger gets pointed at Chef Cole. Can Chef Cole prove her innocence? And what about Chef Cole's love life? When Jasper tells her he wants to date her and Ian sort of shows he may be interested, Carrie Ann doesn't know what to do. She is afraid that is she gives Jasper a chance and Ian does feel something, she may ruin it. What will Carrie Ann do? Will she give Jasper a chance? This was the perfect cozy mystery. I was guessing till the end and then blown away when a new twist was revealed in one of those "I did not see that coming" moments. The book was so fun to read with loads of charm. The characters were cozy and lovable. With great plot building and character development, this book was not just cozy, but a highly enjoyable. It will draw in its readers with entertainment and a fun game of "who done it". Are you ready to see if you can find the killer? I bet you won't figure it out even till the very end. So get ready for some fun and pick up Lord of the Pies. You will not regret it. I can't wait to see what is up for the palace and its crazy employees next. Carrie Ann Cole is an American Chef working for the Duke and Duchess of Cambridge. Yep, Wills and Kate! While she is a fabulous chef who captured the interest of the Duke and Duchess when they were visiting the US, not all of the other palace chefs are that impressed. When Carrie Ann caters a shower being thrown by the duchess, one of her pies kills a palace employee one that shows up as being poisoned. When it appears the murderer may be targeting palace chefs, Carrie Ann must find the murderer either before she becomes the next target or the Duchess no longer feels safe with her cooking for the prince and princess. I love how the author wraps an American into the British royal household. This is a fun and fast paced read. While the second book I. The series, it’s perfect as a stand alone...though you will want to read the first book after finishing this one. 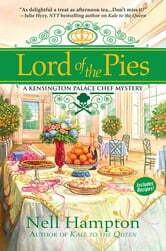 Lord of the Pies by Nell Hampton is the second tale in A Kensington Palace Chef Mystery series. Carrie Ann Cole is the personal chef to the Duke and Duchess of Cambridge in Kensington Palace. Carrie Ann is busy preparing for a pie themed bridal shower being hosted by the Duchess for Penny Nethercott’s sister on Saturday. The gathering gets moved to the Orangery and Carrie Ann will be using Chef Wright’s kitchen. After the event, Carrie Ann leaves a lemon meringue pie as a thank you to the chef and his staff. Early the next morning, Penny awakens Carrie Ann because there are police at the Orangery. A waiter was found face down in Carrie Ann’s pie. The pie was poisoned, and Carrie Ann is the prime suspect in the man’s death. Carrie Ann sets out to clear her name and reputation before she loses the job she loves. After competing in a pie competition, Chef Butterbottom and his staff end up severely ill. Carrie Ann is the runner up, and she is once again under suspicion and in the tabloids. While at the Orangery talking to the sous chef, Carrie Ann learns that Chef Wright has disappeared. They find the flirtation chef dead in the walk-in freezer. The bodies are piling up and the common denominator is Carrie Ann. Can Carrie Ann find the person responsible before she ends up in the tower? While Lord of the Pies is the second book in the series, it can be read alone. Lord of the Pies is a busy book. What I mentioned above in my summary is just a drop in the bucket. There is a stalker, clubbing, baking, another new assistant for Carrie Ann, pie competition, tabloid photographs, Carrie Ann goes out for drinks with Jasper, cooking, chatting, eating and gallons of tea. I thought Lord of the Pies contained good writing, has a steady pace and a great theme (working for the Duke and Duchess of Cambridge at Kensington). The author has a conversational writing style that engages the reader and soon has them engrossed in the story. I like Carrie Ann as the main character. She is well-developed and has excellent cooking skills. She does, though, need to wise up to the ways of the world and proper etiquette (rules) when working in a royal household. I am not so enamored with Penny. I am amazed she can get out of bed for work after a night of drinking and dancing (returning home in the wee hours). The mystery is intriguing. You never knew who the next victim would be (I kept hoping Chef Butterbottom would not recover). Many readers will be surprised when the solution is revealed. There was, though, too much supposition. Carrie Ann with Agnes (her latest assistant) and Penny speculating on the crimes. Some of the same details kept getting repeated. I could have done with less romance between Carrie Ann and Jasper. Her falling into his arms after a harrowing ordeal did not seem believable since the pair have yet to go one a real date (only went out for drinks once). I did not feel any spark between them. Now Carrie Ann and Ian are another story. I am giving Lord of the Pies 4 out of 5 stars (I liked it). The mouthwatering descriptions of pies along with the recipes at the end of the book will have you digging out your pie pans. If you are looking for an entertaining cozy mystery to read, then look no further than Lord of the Pies.